I’m Away from My Emergency Dentist! How Can I Handle a Dental Crisis? An oral health crisis is inconvenient any time, but it’s especially so when you’re on the road. Whether you’re in the middle a business trip or a family vacation, a dental emergency can put a huge damper on your travels and cause you significant pain. But don’t panic! 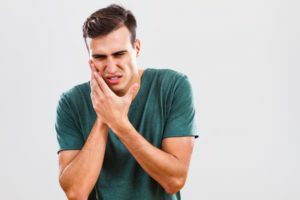 With this advice from your emergency dentist in Herndon, you’ll be able to handle the situation calmly and get on your way to recovery as quickly as possible. If it has been more than six months since your last dental checkup, schedule an appointment before your trip. If your dentist in Herndon notices any issues that might lead to an emergency in the near future (such as untreated decay), you might have time to get them taken care of before you embark on your travels. In case the worst does happen, you should pack a few supplies that can help you cope with a dental emergency. For example, clove oil is excellent for fighting oral pain. Some gauze, over the counter pain medications, and your dentist’s contact info are also essential items. Even if you are too far away from your normal dentist to visit them right away, you can still call them and ask for advice. Describe the situation in as much detail as you can. If you require immediate treatment, they may advise you to visit a dentist who is closer to your current location. Or, if the situation is relatively mild, they can give you tips on how to care for your mouth until you come home and can see them. A chipped or broken tooth. Rinse your mouth with water and use gauze to control any bleeding. A cold compress can mitigate swelling. Sometimes, a broken tooth is mostly a cosmetic issue. In other cases, you become much more vulnerable to infection. It’s best to err on the side of caution and see a dentist as soon as you can. A knocked-out tooth. Holding the tooth only by the top part, rinse off any debris. Then, place it back in its socket or in a glass of milk or water. If you get to a dentist ASAP, they may be able to reattach it. A lost crown. You might be able to temporarily reattach the crown with dental cement from a local pharmacy. If it doesn’t want to fit, don’t force it. Avoid chewing with that tooth and use clove oil or pain medication to manage your discomfort until you get to the dentist. A serious toothache. Use the tooth as little as possible. If it looks significantly darker than the ones around it or you are experiencing throbbing pain, you may need a dentist to perform root canal therapy. Hopefully, a dental emergency will not ruin your trip. If something does happen, use the above guidance to get through the situation with as little stress and pain as possible. Dr. Farshad Bakhtyari is an accomplished general dentist who is always ready to leap into action to help patients deal with urgent oral health problems. If you ever find yourself facing a dental emergency, contact our office right away at 703-860-8860. Comments Off on I’m Away from My Emergency Dentist! How Can I Handle a Dental Crisis?